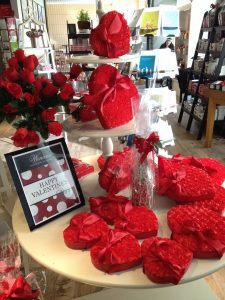 With Valentine’s Day upon us, sentimental folks might recall their own romantic moments. My special memory begins in the early 1990s, when I was the owner of a shabby chic store. Back then, as a thirty-something single mom, it wasn’t easy to make ends meet selling the discarded treasures of others. Auctions, flea markets, and garage sales were the way I stocked my vintage shop. One summer day, I stopped at an estate sale. The attached garage of the stately brick home was filled with the earthly goods of an elderly widow. As she walked towards me, the old woman’s fragile condition caused her to lean heavily on a three-pronged cane. She was liquidating over a weekend, what had taken a lifetime to collect. Her gray hair was disheveled, and her eyes reflected the resignation that must have cost her a great deal. The widow needed to sell everything, and move to a place where she wouldn’t be alone. The newspaper’s classified ad didn’t say all that, but it didn’t take much to figure it out. I decided to buy a few things to help her in her season of transition. “To everything there is a season, and a time for every purpose under heaven…a time to keep and a time to cast away.” I had always liked this insightful wisdom from the Book of Ecclesiastes, but the verses weren’t very comforting in light of this woman’s heartbreaking circumstances. After all, it was my “time to keep,” and her “time to cast away.” That’s why I let her do all the talking. I never even asked the stranger her name, since she didn’t volunteer it. I’m not sure, whether the aged woman gave me a look of disbelief, relief or resignation. Her reaction didn’t matter. I made a promise, and I intended to keep it. 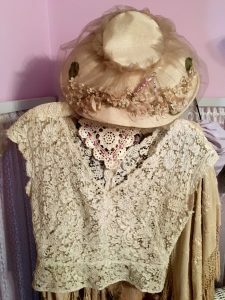 For years, I hung the bodice on a satin hanger displayed with some antique hats on an oak coat rack in the apartment where my young son and I lived. I never planned on wearing it, because being divorced for over a decade, I assumed my days of being a bride were over. Then I met Larry Claypool. Larry was a forty-something school administrator who had never married. Almost right away, we both felt that divine providence had brought us together. On February 9, 2002, I sensed that Larry was going to propose. That morning as I dressed for our date, I instinctively reached for the ivory top, which represented decades of a marriage that had lasted. I had never worn the blouse before, so I carefully removed it from its satin hanger and put it on over an off-white camisole. Larry surprised me by taking me to the Swan House Tea Room in Findlay, Ohio, where he knelt down on one knee, and asked me to be his wife. The busy teahouse filled with women fell strangely silent. When I said, “Yes,” the hushed patrons erupted in congratulatory applause and joyful laughter. 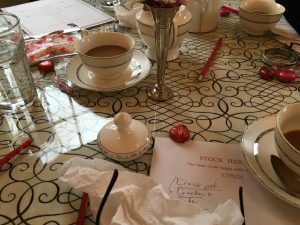 Recently, an older never-married-friend whom I hadn’t seen in over 15 years invited me to her bridal shower the first week of February 2017 at the Swan House. Exactly fifteen years to the week of my romantic proposal there. It was only right to wear the antique top to the tea room again, because this June Larry and I will celebrate our fifteenth wedding anniversary. The vintage blouse remains a cherished memory of my own proposal coupled with another bride’s long ago wedding day. Unfortunately, I will never know her name. Still, I intend to keep my promise to her to care for it – for as long as time allows. June might be the traditional month for weddings, but all year long beautiful brides in flowing white gowns and handsome grooms in black tuxedos promise to be together, “Until death do us part.” Sadly, if we look at the grim statistics, many of these marriages are destined for divorce courts. “Sometimes, we agree to disagree,” Arlene admitted. But don’t let a disagreement cause you to imagine that, “We are not suited for each other, [or that] we can’t make this work,” she said. Rather know, “This too will pass.” They attend the First Baptist Church. “…The same faith is a real grounding in sharing what’s important…you are accountable to God even if nobody else knows what’s going on,” said Mrs. Gates. In a long-term marriage, Arlene mentioned the importance of keeping the “romance and love” alive.” The Gates are also concerned about the lack of positive role models for young people faulting today’s media and celebrities for portraying a skewed picture of reality. Mary Kathryn Mescher of Fort Loramie would say her role models were her own family. She and 74-year-old husband, James who is retired from Midmark Corporation, celebrated their 50th wedding anniversary this past June. Although the 71-year-old wife never received any specific advice from her parents, their example of a fifty-plus-year marriage was a living testimony. “We were just brought up when you got married you were married. You sort of follow in their footsteps…how they lived. My husband’s father and mother were married 65 years, and I guess that’s what we are shooting for,” she said. “There’s a lot of difference now days between the kids and us. They have jobs and can make it on their own,” explained Mrs. Mescher. “We were home with our children. We quit working. We relied [on our spouses] to bring the money in….It was a kind of partnership,” she explained of the cultural shift with women working outside the home. Sharing happenings about her children and grandchildren is one experience that Sue Britton misses greatly. “It’s lonely being alone… There isn’t a day that goes by that I don’t say, ‘Wait until Bill hears this,” said the 78-year-old widow. Sue and her late spouse, Bill Britton were both battling cancer at the same time three years ago. She survived her bout with ovarian cancer, but tragically Bill succumbed to lung cancer three years ago this past May. Married in 1955, the couple shared almost 55 wonderful years together. “My father always told me to marry a man who is good to his mother…and Bill was.” Sue is grateful she followed her dad’s wise advice. The couple raised three children together with Sue spending “ninety percent of her married life as a housewife.” Her suggestion for a good marriage is to, “Just trust each other…in every way.” If there are, “any reservations, don’t marry them,” she warned. In closing from the road less traveled, if you have some things to tell someone you love, why not do it today. After all, they might not be here tomorrow to listen. Christina Ryan Claypool is an Amy Award winning freelance journalist. This column originally appeared in the Sidney Daily News in June 29, 2012.